When it comes to natural sweeteners, the first thing that strikes the mind is definitely honey. A sweet liquid, honey is made by bees from the nectar of flowers. Organic honey is collected from wild bee colonies or domesticated beehives. Honey is a delicious and natural sweetener that many of us prefer in our milk, juice, tea, lemon water or simply on our bread. A rich source of natural sugars, honey contains antioxidants and flavonoids that are beneficial for health. Its potent antibacterial and antiseptic properties help keep bacterial and fungal infections at bay. Other nutrients that honey has are riboflavin, niacin, vitamins B12 and C, calcium, iron, potassium, phosphorus and magnesium. Looking at the nutritional profile of honey, it would not be wrong to say that it is nature’s answer to many health problems. This is why honey has indeed been a favorite among nutritionists, dieticians, beauty experts and Ayurveda practitioners. In fact, for centuries, honey has remained an integral part of our lifestyle and especially for taking care of our health. Here are the top 10 home remedies using honey. Minor wounds, grazes, skin abrasions and cuts are common in everyday life. Now, when you need to treat a minor wound or cut, just grab your jar of honey. Honey works as a natural antiseptic and has many antimicrobial properties that can sterilize wounds and promote healing, while also reducing pain, odor and the size of the wound. Also, it has an enzyme that produces hydrogen peroxide, which adds to honey’s wound-healing capabilities. A 2006 study published in the International Journal of Lower Extremity Wounds highlights the effectiveness of honey in assisting wound healing. Another study published in the BMC Complementary and Alternative Medicine in 2010 shows that Manuka honey can boost healing time and reduce infections in wounds. A 2011 study published in the Scientific World Journal supports the use of honey for wound healing, as it stimulates tissue growth. It also reduces the risk of developing an infection, thanks to its antioxidant and hydrogen peroxide content. Again, a 2012 study published in AYU reports that there was significant improvement in the healing process of wounds due to honey’s antibacterial, wound-cleansing and wound-healing properties. · Simply put a layer of pure honey on the site of the wound. Cover it with gauze and a bandage, if needed. Replace it a few times a day, as needed. · Alternatively, mix equal amounts of honey and turmeric and apply it on the wound 2 or 3 times a day. You can leave it on for at least 30 minutes before rinsing it off. Many of us experience minor burns, and there is nothing to worry about if you have a jar of honey at home. Raw honey can soothe and heal the skin, and its natural antibacterial properties effectively prevent infection. A 2007 study published in the Annals of Burns and Fire Disasters reports that honey is effective for burn treatment because of its antibacterial action, low pH, high viscosity, hygroscopic effect and hydrogen peroxide content. Another study published in the Journal of Cutaneous and Aesthetic Surgery in 2011 found that honey dressings sterilize the wounds in burn patients in less time, enhance healing and produce better outcomes in terms of hypertrophic scars and post-burn contractures, as compared to silver sulfadiazine dressings. Again, a study published in the Annals of Burns and Fire Disasters in 2014 draws the attention of both medical staff and patients to the benefits of using honey in burn treatments. 1. Immediately after getting a burn, rinse it under cool running water. 2. Simply dab some honey onto a minor burn. 3. Lightly cover the affected area with a gauze bandage. 4. Repeat as needed until the wound is healed. When you’ve got a sore throat or a cough, you don’t need over-the-counter medicines. A spoonful of honey can provide you instant relief. Even the World Health Organization and the American Academy of Pediatrics recommend honey as a natural cough remedy. Honey works as a cough suppressant. It also helps clear out the mucus and soothe your throat. A 2010 study published in the Journal of Alternative and Complementary Medicine demonstrated that a 2.5-mL dose of honey before sleep had a greater alleviating effect on coughs due to upper respiratory infections compared with the commonly used dextromethorphan and diphenhydramine medications. Also, a 2013 study published in Pediatric Reports recommends honey for its topical demulcent effect in treating a cough. Another study published in 2014 in Canadian Family Physician concludes that honey can be recommended as a single dose of 2.5 mL before bedtime for children older than 1 year of age who have a cough. You can use honey in various ways to treat coughing and a sore throat. · Drink a cup of hot milk or soothing herbal tea with 1 tablespoon of honey twice daily to soothe a sore throat. 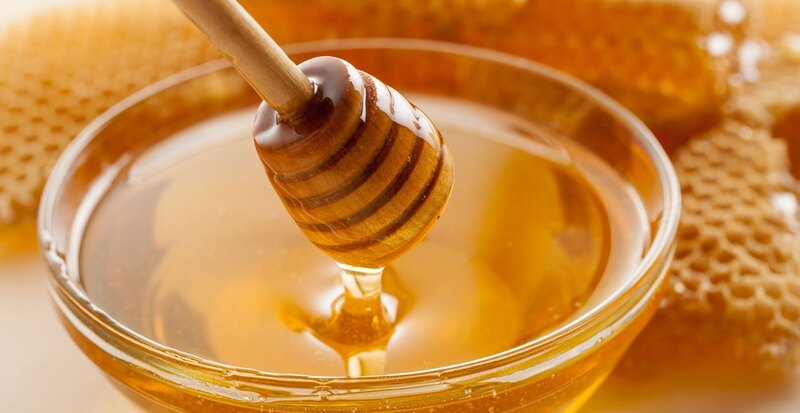 · Have 2 teaspoons of honey 30 minutes before bed to enjoy less coughing and better sleep at night. · Put 1½ tablespoons of lemon zest, ¼ cup of sliced ginger, 1 cup of water and ½ cup of lemon juice in a small pan. Bring it to a boil, then let it simmer for another 5 minutes. Strain and add 1 cup of honey to the liquid. Give ½ teaspoon to 1 tablespoon of this solution every 2 hours, depending upon the person’s age. Psoriasis is an autoimmune disease that affects the skin cells and causes redness, blisters, itching and even lesions. You can always rely on honey to get fast relief from the irritating symptoms of psoriasis. Its moisturizing property forms a protective layer on broken skin and helps relieve the dryness, patching and peeling away of the skin. Plus, it has anti-inflammatory compounds that fight inflammation and boost the immune system. A 2014 study published in the Journal of the Royal Society of Medicine Open found that Kanuka honey may have similar efficacy to aqueous cream in the management of psoriasis. However, this requires confirmation through further study. · Rub some honey on your dry, patchy skin. Let it sit for about 30 minutes before washing it off. Do it 1 or 2 times a day, as needed. · Alternatively, put 1 teaspoon each of honey, olive oil and beeswax in a microwave-safe bowl. Warm the mixture in the microwave until the beeswax melts. Stir the mixture and allow it to cool down. Apply it on the affected area as a lotion a few times a day. If you’ve recently started to forget things or you’re unable to recall things, honey can save you from this problem. This natural sweetener can improve both short-term and long-term memory. In a 2011 study published in Menopause, researchers found that postmenopausal women who were given Tualang honey for 16 weeks showed much improvement in their immediate memory as compared to women who were given estrogen and progestin hormone therapy. Another study published in Evidence-Based Complementary and Alternative Medicine in 2014 found that honey polyphenols are useful in improving memory deficits and can act at the molecular level. Another study published in 2015 in Medical Sciences reports that improvement in learning and memory following Tualang honey supplementation is due to the significant improvement in brain morphology and enhancement of the brain cholinergic system, which is possibly secondary to reduction in brain oxidative damage and/or up regulation of brain-derived neurotrophic factor concentration. · The simplest remedy is just to take 1 to 2 tablespoons of local honey, either in the morning 30 minutes before breakfast or just before going to bed. · Alternatively, mix 1 teaspoon each of honey and powdered ginseng. Add 1 cup of lukewarm water to the mixture. Mix well and drink it while it is still warm, once daily. Honey is also good for the overall digestive system. Whether you have gas, indigestion, acid reflux or diarrhea, honey can rescue you from the discomforts. Honey aids in cleansing the colon by eliminating the toxins. It helps promote good bacteria in the colon, resulting in better digestion. This in turn helps prevent and treat symptoms of bloating, gas and acid reflux. A 2006 study published in the Sultan Qaboos University Medical Journal reports that honey can help shorten the time required to eliminate H. pylori from the stomach lining of patients with gastritis or a duodenal ulcer caused by H. pylori infection. Another 2006 study published in BMC Complementary and Alternative Medicine reports that substituting sugars with honey in processed food can inhibit the harmful and genotoxic effects of mycotoxins, and improve the gut microflora. Also, a 2017 study published in Food Quality and Safety highlights the positive effect of honey in improving the gut microbial balance. · Take 1 to 2 teaspoons of honey on an empty stomach to soothe abdominal pain and prevent gas and bloating. · Sprinkle a pinch of cinnamon powder on 1 tablespoon of honey. Take this mixture before your meals to prevent digestive problems. If you need help getting quality sleep or want to treat sleep apnea naturally without taking pills, honey is the right solution. Honey promotes sleep by ensuring an adequate supply of liver glycogen while you sleep at night. If your body has inadequate liver glycogen, your brain will trigger an emergency search for fuel, which can lead to disturbed sleep. Honey also stimulates the release of insulin and allows tryptophan to enter the brain easily. This contributes to the release of melatonin in the brain. Melatonin is a hormone necessary for restorative sleep. For sleep apnea, honey helps reduce swelling around the throat area that can obstruct airways. In addition, it lubricates the throat to prevent snoring, one of the most common symptoms of sleep apnea. · Before going to bed, drink a cup of herbal tea or a glass of warm milk with 1 teaspoon of honey in it. · Another option is to mix 1 teaspoon each of honey and black pepper powder in a glass of warm water. Sip it slowly before going to bed. Honey is often used in skin care products and is commonly used to treat acne that mainly occurs due to excessive oil secretion and bacteria and trapped dirt clogging the skin’s pores. It also has antimicrobial properties that help fight bacteria that cause acne. And its anti-inflammatory property helps reduce acne symptoms and prevent infections. Plus, honey keeps your skin moisturized and prevents clogged pores. · Apply raw honey on your acne and the skin around it. Allow it to sit for 20 to 30 minutes. Rinse it off with lukewarm water. Repeat 2 or 3 times a day. · Alternatively, thoroughly mix 1 tablespoon of honey and ½ teaspoon of cinnamon powder. Apply it on the acne-affected area. Allow it to sit for 15 minutes, then rinse it off well with warm water. Repeat once or twice a day. This remedy, however, may not suit those with sensitive skin as cinnamon can be too strong for some skin types. Honey is also effective at boosting the immune system. High-quality honey contains many important antioxidants, such as phenols, enzymes and compounds like flavonoids and organic acids. These antioxidants help protect your body from cell damage due to free radicals. Free radicals not only accelerate the aging process but also contribute to the development of chronic diseases, such as cancer and heart disease. A 2010 study published in the African Journal of Traditional, Complementary and Alternative Medicines shows that polyphenols in honey may play a role in preventing heart disease . Honey also has antibacterial and antiviral properties that help the body fight and kill harmful bacteria and viruses. 1. Mix 1 tablespoon of organic honey into a glass of lukewarm milk. 2. Add ¼ teaspoon of cinnamon powder and mix well. 3. Drink it once daily before going to bed. Honey is simply good for your hair health. It is an emollient, which means it seals moisture into your hair, keeping it conditioned. This in turn reduces breakage and improves hair growth. Honey also has rich antioxidant properties that prevent damage, keeping your scalp and hair healthy. It can also control dandruff, one of the reasons behind hair loss. A 2001 study published in the European Journal of Medical Research concluded that crude honey could markedly improve seborrheic dermatitis and associated hair loss and prevent a relapse when applied weekly. · Prepare a hair mask with equal amounts of honey and plain yogurt. Apply it on your wet hair. Wear a shower cap for 30 minutes, then shampoo your hair. Use this hair loss treatment 2 or 3 times a week. · Mix ½ cup of raw, organic honey and ¼ cup of extra-virgin olive oil in a bowl. Warm this mixture in the microwave. Apply it on your scalp and work it through to the ends of your hair. Allow it to sit for 20 minutes. Wash your hair with a mild shampoo. Use this dandruff remedy twice a week.